"There was not a finer organization of citizen soldiery in America." Welcome. 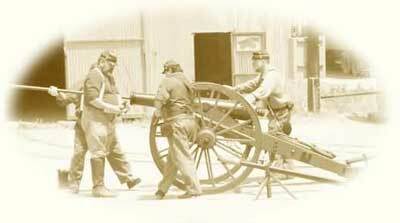 The Washington Artillery was accepted into the Confederate Army in May 1861, the first four companies went to Virginia immediately and took part in the 1st Battle of Manassas (or Battle of 1st Bull Run, to the federals). From that time on, the Washington Artillery remained with the Army of Northern Virginia throughout all its major campaigns. The unit especially distinguished itself in the defense of Marye's Heights during the Fredricksburg and Chancellorsville campaigns. As Civil War re-enactors, we take great pride in this legacy. Our site is currently under construction and will probably always be a "work in progress". As the site progresses and grows, you will see such things as the History of The Washington Artillery, our history as re-enactors, photo galleries of our events, our calendar of events, information about artillery in the Civil War, as well as general Civil War information and minutiae. In the meantime, for further information about Civil War Reenactments, please visit The American Civil War Society website at www.ACWS.net.